2006 and we’re still borrowing French kids entertainment. 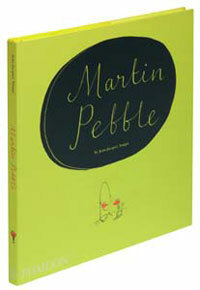 Yes, around 40 years after we dubbed the likes of the Magic Roundabout and Hector’s House, Phaidon has issued the first translation of the classic French children’s book Martin Pebble by Jean-Jacques Sempé. Originally from 1969, Martin Pebble is the story of a little boy whose face keeps turning red for no particular reason. He meets Roddy Rackett, a little boy who keeps sneezing for no particular reason – and begins a great friendship – until they’re separated, only to be reunited years later on a crowded bus in the city. Told through images, speech bubbles and short linking text, the book is the work of famous/much-loved French illustrator Jean-Jacques Sempé, translated for the first time by award-winning translator Anthea Bell.